The Geelong Advertiser has this fascinating bit of local lore in the paper this week. Devil's Pool, the Bunyip Hole - the Barwon River precinct at Queens Park better known as Buckley Falls, for the British convict who lived with Aborigines for 32 years - has long hosted an unusual rocky cascade, water race and remnants of a long-gone industry. That's not to mention enough snakes among its rocks to make anyone nervous on a warm summer's day. But as a picturesque riverside scene it is difficult to match the bluestone, red brickwork and craggy texture of the former paper mills that operated at Buckley Falls from 1878 to 1923. At its height, the mill employed 200 people, making paper from not just wood pulp but rags, sacking, used paper, rope ends and other species of refuse to make some 40 different types of paper for writing, printing, wrapping, blotting and more. It was set up by Robert Miller, at a cost of between 40,000 and 50,000, as the Barwon Paper Mill. It underwent various changes of ownership; in 1888 to Victorian paper Manufacturing Company and two years later again to H.L. Littlewood & Co. The mill buildings lay unoccupied from 1923 to 1929 after which the Hydro Manufacturing Company ran iceworks and cool storage until the war years. More recent years have seen them utilised as factoriettes for a variety of trades pursuits. The 3/4-mile water race to a Belfast-manufactured turbine that generated some 300 horsepower of cheap electricity to the mill was constructed by 30 men who blasted their way through solid rock, presumably oblivious to the devil or bunyip allusions of the pool. Had they been aware of local bunyip lore, however, they might have been a tad nervous. For some years earlier, in the 1840s, a bunyip scare struck fear into the fledgling Geelong settlement. As this newspaper reported in 1845: "We have been favoured by Mr Menzies with the inspection of a petrified bone found on the shores of Lake Timboon to the westward of Lake Colac. "The bone is apparently the head of the tibia, or lower joint of the knee. The dimensions of this fragment of bone are of the most colossal nature, measuring as it does 10 inches across the front of the knee (in diameter, not circumference)." On being shown to an "intelligent black" it was "at once recognised ... as belonging to the bunyip". This was corroborated with several other Aborigines. No big deal, you might have thought, but next came detailed reports of several bestial attacks on animals: a mare at Little River, a mutilated cow near Barwon Heads. 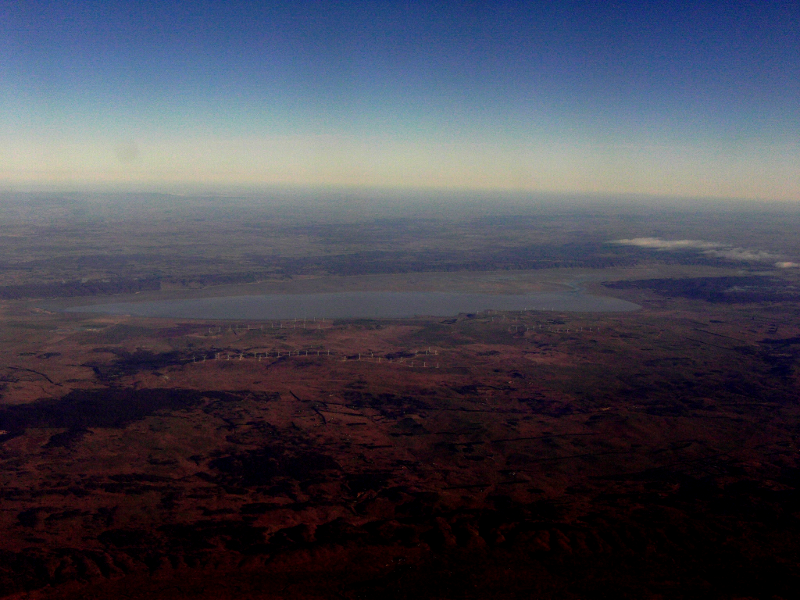 Bunyip fever whipped through the area. And purported attacks further afield even led scientists of the day to study and speculate on the Timboon bone. Hysteria peaked in 1847-48 when a bunyip "skull' was found in a stream near the Murrumbidgee River. But the scientists were never able to corroborate any bunyip. Speculation has since ranged from seals to bitterns to diprotodons but the creature has remained steadfastly untouchable - and consigned to history as much as Robert Miller's operations next to the Bunyip Pool. A mysterious blood-thirsty wild cat is feared to have struck again after three wallabies were found devoured on farmland in the Cotswolds area of the United Kingdom. The trio were found stripped to the bone, with their internal organs neatly placed beside their bodies. Examinations revealed they had suffered puncture wounds to the neck - consistent with a vicious attack by a panther-like creature. Experts now believe the animals were devoured by the Wildcat of Woodchester which is already believed to have killed three times this month. The mutilated bodies of three deer have been found in the past few weeks in countryside near Stroud, Gloucestershire - just 12 miles from where the wallabies were mauled to death. Samples of DNA from the predator's first deer kill on January 4 are currently being tested to confirm whether or not a big cat is behind the killings. The results are expected to be revealed over the next few days. But big cat expert Frank Tunbridge is in no doubt over who killed the wallabies and the deer. 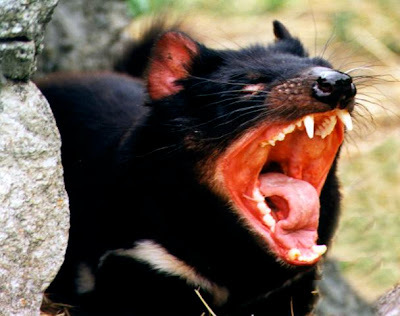 Mr Tunbridge, 65, said: 'There could be no creature other than a big cat that could bring down and kill these wallabies. 'The field was surrounded by a 7ft fence and there was no apparent entry signs - so the predator must have leapt over it. 'The killer struck over two nights. 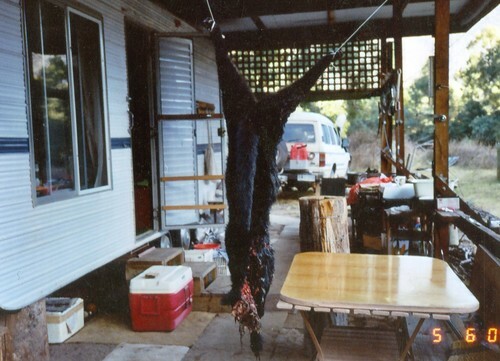 The first night he killed two wallabies, stripped one of the carcasses down and hid the other under a pile of leaves and straw. 'Then he came back and killed a third - devouring his further kills. A fourth wallaby appears to have died from a heart attack. 'The wallabies are only about 12 miles from Woodchester so it appears that this could be the same big cat. The wallabies, part of a private collection, were found by their devastated owner on January 6 - two days after the apparent first kill by the Wildcat of Woodchester. The Gloucestershire farmer did not want to divulge his name or location. But he did release gory pictures of one of the dead wallabies. The carcass had been ripped open in a similar way to the three roe deers the beast is believed to have slayed. 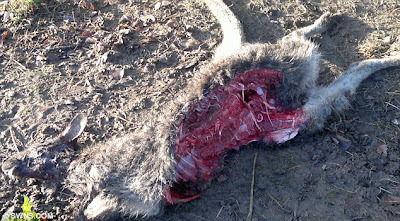 The first deer had been torn open and was missing its heart, kidneys and liver. Its snout was also missing - important because big cats clamp their jaws over the mouth, causing death by suffocation. Experts believe the deer was brought down and devoured by a large and powerful predator such as a puma, jaguar or leopard. Tufts of the animal’s fur were also found piled by the body - and such predators neatly pluck the hair from the body before shearing their teeth into the flesh. Another deer carcass was found by a dog walker between Whiteway and Redcomb, near Cirencester - ten miles away - on January 10. A third roe deer body was found at a development in Cooper’s Edge, near Gloucester, days later. 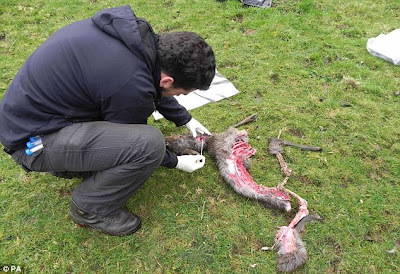 Dr Robin Allaby, an expert in evolutionary genetics at Warwick University’s School of Life Sciences, is studying samples of DNA taken from the first carcass. He said: 'I’m prepared to believe in the existence of big cats in the UK and we have a reasonable chance of finding out if it was there. Is this the culprit? 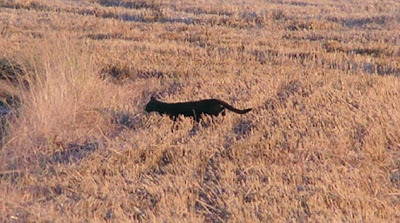 A picture of a large black cat taken in the area. Melbourne's zoos will become urban arks, breeding sanctuaries for 20 of the most at-risk species in the state, as scientists struggle to save them from extinction, according to The Age. Flagging a strategic shift to become a ''zoo-based conservation organisation'', Zoos Victoria - which includes Melbourne Zoo, Healesville Sanctuary and Werribee Open Range Zoo - has released a ''priority'' list of species it believes are in urgent need of help. The list includes 11 species that are already the subject of the zoos' conservation efforts, including the Tasmanian devil, mountain pygmy possum and orange-bellied parrot. Nine additional vulnerable species, including the Baw Baw frog, Leadbeater's possum, the alpine she-oak skink and the Guthega skink, are set to be brought into captive breeding programs in the coming months. 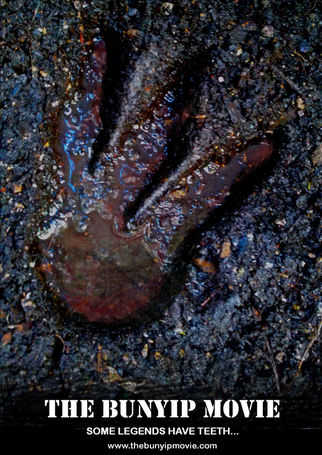 Yowie footprints in the bush? Is this a Yowie footprint? This bushwalker is puzzled when he finds a solitary human-looking footprint in otherwise remote, untouched bushland. What do you think? We're not sure, but The Bunyip Movie is the fourth Aussie cryptid film on the books in the past two years, albeit another horror much along the same lines as Gone Missing (except the big cat has been replaced with a feisty bunyip). And they have all passed through the Blue Mountains shooting their Yowie/Bunyip-related docu- and mockumentaries. Following in the steps of The Blair Witch Project, the original suspense horror Alien and the inspired crowd-sourcing heart of films like The Tunnel, The Bunyip Movie* (working title) is a micro-budget suspense horror being shot in New South Wales, Australia. Entrepreneur Tanc Lorenzo has just sold his tech security startup, ThinkTanc, for millions. As he and his small team of staff set out on their usual monthly team-building weekend, the new Board of Directors makes their presence known. No longer will Tanc's team-building trips consist of death-defying sky-dives, supersonic flights or bungee jumps - this time, he's taking the team on an easy 2-day hike in The Blue Mountains. But when Tanc disappears on the first night, the team discover that their tame weekend away is turning out unexpectedly. Pursued by an unseen and malevolent creature in the harsh Australian wilderness, the group will have to overcome all odds just to survive. Who knows, they may well come across some real cryptids during their shoot! Of course the Blue Mountains are better known for bush-bashing Yowies rather than water-dwelling Bunyips - a small technical detail! 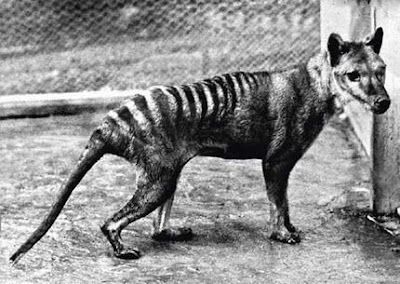 People should stop wasting time and money looking for the Tasmanian tiger, according to new Australian research. Dr Diana Fisher and Dr Simon Blomberg from the University of Queensland's school of biological sciences report their findings in a recent issue of Conservation Biology. Since the last wild thylacine was captured in 1933, there have been ongoing searches and numerous unconfirmed sightings of the carnivorous marsupial. But, says Fisher, such efforts are misguided. "There's been more search efforts for the thylacine than any other mammal globally," she says. "I think that's just a waste of money." 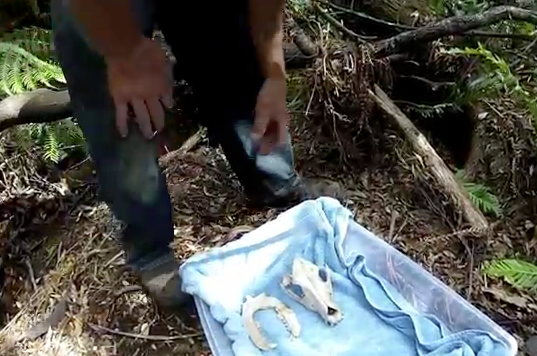 A discovery of an animal skull in regional Tasmania caused much excitement today in Australia, but it turns out the animal remains are nothing more than a dog - not a Thylacine as first claimed. Updating their website several hours ago, the skull's discoverers - brothers Levi and Jarom Triffitt - said the results were in. "The museum have told us its a dog skull but still can't identify what sort, our story is as we have filmed it bar the lobster which was filmed 2 months ago, however we were looking for﻿ lobsters and to find this skull was an amazing experience we'll never forget, we will still live in hope they are out there somewhere..."
The trail bike riders discovered the skull while filming during a ride through bushland. They say they were riding in bushland in central northern Tasmania last week while filming stunts for a promotional video when they came across the skull. "Lot's of people think 'dog', but when you actually get on Google and compare it to your normal dogs that are in Tasmania, the closest thing we could find it to was an American timber wolf, which I don't believe we have here," Jarom said at the time. The last known tasmanian tiger died in the Hobart Zoo in 1936. Mystery goat killer - was it a big cat? A quick visit to a mysterious pile of bones on Sydney's outskirts...a chilling discovery. Is it the killing ground of an Australian Big Cat? We've pulled up some more video from the archives about one of our favourite topics - the yowie! Two glowing red eyes, an ominous growl, flying stones, tortured screams...what could it have been? The Victorian Government has downgraded its promised investigation into the existence of puma-like big cats in Victoria after senior bureaucrats poo-poohed the idea. Shock! Horror! Not really a surprise when the Victorian Government investigation never really got off the ground. In echoes of the NSW Government investigation into the big cat phenomena, it was over before it began - a hollow promise, a quirky news story, nothing more. Instead, public servants will look at the accumulated paperwork regarding the hundreds of big cat sightings and unexplained livestock deaths in the past decade. Perhaps they should cut some corners and buy a copy of Australian Big Cats: An Unnatural History of Panthers instead! Department of Primary Industries documents released under Freedom of Information to the Herald Sun newspaper show the inquiry has been downgraded to a "small desktop study of existing documents". The downgraded probe follows a negative report from the DPI's Biosecurity Victoria. Biosecurity Victoria executive director Hugh Millar memoed Agriculture Minister Peter Walsh stating there was no evidence to support theories that "giant black cats the size of pumas or panthers" were killing Victorian livestock. "In all likelihood, reported sightings of big cats are just that, feral cats ... or misidentification of black wild dogs or even foxes," the memo states. Acting Opposition agriculture spokeswoman Jacinta Allan said the government documents proved the promised inquiry was a waste of resources. "While elective surgery waiting lists blow out, Victorians lose jobs in a weakened manufacturing sector and business investment flees the state, the Baillieu Government is still wasting taxpayer funds chasing mythical big cats," she said. But Mr Walsh, who last year said the probe would find out the truth about big cats "once and for all", said the issue remained important to rural Victorians. He said the inquiry, a "desktop study" of Parks Victoria staff and wild doggers' field work and species survey work, would begin after an aerial wild dog baiting program ended. 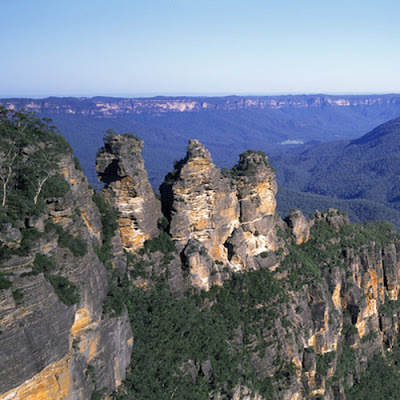 In today's post we continue to 'get our Yowie on' with another witness interview from the Blue Mountains, west of Sydney, NSW, carried out only this week with thanks to local researcher Neil Frost. Our witness Sean shares his unsettling tales of camping trips with uninvited hairy guests and inexplicable showers of stones! Over the years we've amassed quite a bit of interesting footage - mostly witness interviews but occasionally wildlife footage as well. We've also been given footage to share, and this latest offering from authors Tony Healy and Paul Cropper is a pearler - an interview with a man who saw the Lake George Yowie in the mid-1970s! 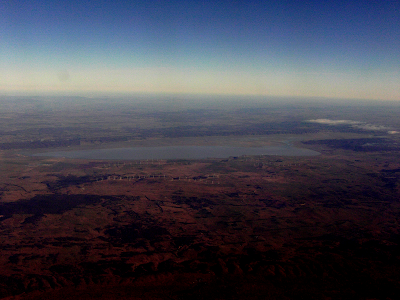 Lake George (also known by its indigenous name Weereewa - 'bad water') is an aquatic conundrum, a 25km long shallow, salty body of water that lies between Sydney and the nation's capital, Canberra. Its ebb and flow - the Lake will dry up completely for years at a time - has been the source of much local superstition and legend. Several fishermen and five Duntroon military academy cadets have drowned in its waters, and all manner of things have been found when the waters have receded - including a plane! 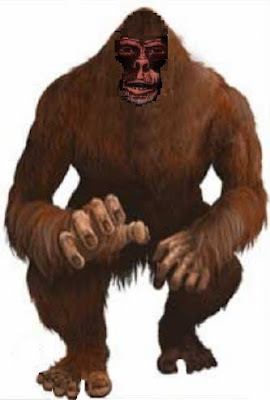 All kinds of phenomena has visited its unpredictable shore - ghosts, UFOs, and as you'll hear now, even Australia's own bigfoot, the yowie! A peek at one of our bookshelves, courtesy of Tania Poole. 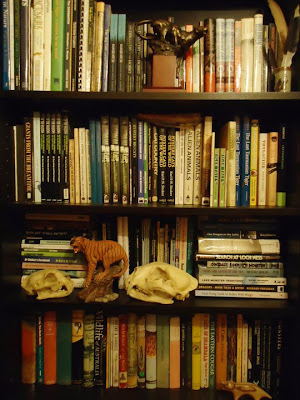 The year ahead holds plenty of promise - including a growing list of interesting cryptozoology and naturalist books. We've pulled together a few that have caught our eye and presented them here to share with our readers. (We've just noticed a slight anomaly - if one of the links comes up as a generic Amazon ad, just refresh the page to get the book link.) Enjoy! The Encyclopaedia of New and Rediscovered Animals by Karl Shuker. The Black Rhinos of Namibia: Searching for Survivors in the African Desert by Rick Bass. The Kirtlands Warbler: The Story of a Bird's Fight Against Extinction and the People Who Saved It by William Rapai. The Existence of Sasquatch and Yeti by Carol Hand. Abominable Science: Origins of the Yeti, Nessie and Other Famous Cryptids by Daniel Loxton and Donald R. Prothero. I'm sure there will be plenty more so keep your wallet handy. Normally we only feature news about wild animals on the endangered and extinction lists. But a rare breed of domestic dog, once popular among royalty and celebrities, is on the brink of extinction and probably deserves a mention. Sealyham Terriers were first bred for pest control, but are now rarer than endangered species such as giant pandas and tigers! The breed's popularity soared in the 1920s, when the Kennel Club - the UK's largest dog organisation - registered more than 2000 puppies every year. The breed was exported overseas and bred here in Australia. The dogs, often described as intelligent and loyal, were favorites with celebrities like Elizabeth Taylor, Cary Grant and Alfred Hitchcock. Their gregarious personalities and boundless energy, meant they remained sought after for decades, and in 1959 a Sunday newspaper reported, "A notice has been posted in Clarence House and Windsor Castle giving explicit instructions that when Princess Margaret has breakfast in bed, her two Sealyhams must be brought to the room along with her breakfast tray." But last year only 49 were bred in the UK, the breed's home, putting them on the Kennel Club's top three most endangered native breeds list. The dramatic change is attributed to new fashions, the availability of a greater number of breeds and the decline of ratting as a form of vermin control. Sealyham Terriers are believed to be a mix of the now extinct English White Terrier combined with Dandie Dinmont, the Fox Terrier, the West Highland and the Corgi.